There is something mystical, magical and utterly captivating about an island. Particularly a small one like the Isle of Wight. Acquiescent in its geographical limits, yet baffling in its sense of ‘otherness,’ its sense of isolation from a more consequential mainland. On Sunday, on a sudden whim, we headed across the island to visit Mottistone Manor, an Elizabethan estate in the picturesque village of the same name. 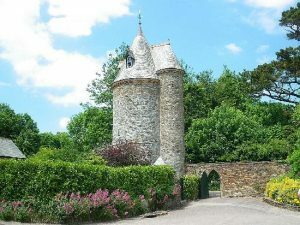 It is a National Trust property, although only the gardens are open to the public. The house was apparently the venue for the wedding of Benedict Cumberbatch to director Sophie Hunter in 2015. Mottistone is only a mile and a half from the south-west coast of the Isle of Wight, tucked into a secluded valley in the hills below the Downs. It is early spring, and the formal gardens are looking sparse, but will come into their own later in the year. These gardens have been redesigned using plants common to the Mediterranean and drier areas of the southern hemisphere, to ensure less water is needed to maintain them. This not only came about because a previous lady of the manor was Sicilian, but because the Isle of Wight is not self-sufficient during summer, and must bring water from the mainland, through pipes beneath the Solent. Meanwhile, the wilder side of the garden is awash with well-known English plants: azaleas, rhododendrons and camelias, heavy with dark pink flowers. Across the grassy banks is a profusion of daffodils and narcissi. Magnolia buds are on the verge of blooming. In the orchard, fruit trees look positively bridal in white and pink blossom, the grass beneath carpeted with primroses. A hillside grove of young olive trees overlooks the kitchen garden. The house itself is a grey stone manor reminiscent of my favourite National Trust property, Ightham Mote without the moat, and I am sorry not to get a peek inside. Further up the valley, we discover woodlands on the cusp of bursting into a full-throated chorus of bluebells. We plan to come back in a week or two to see them at full throttle. Leaving the woods through a kissing gate, we follow a steep, sunken path uphill. As the path emerges onto Castle Hill, we are confronted by a pair of ancient stones: a megalithic standing stone or menhir made from local sandstone four metres high, with a smaller one lying at its foot. It is said thy were dislodged by the Saxons and, later moved by a nineteenth century squire, so that today they no longer stand where they are thought to have been originally planted: at the entrance to a nearby Neolithic burial ground, or possibly as part of a druid temple. The National Trust website suggests that ‘moot’ is Saxon for meeting, and it seems probable that the menhir provided a meeting point for the Saxons, and that Mottistone is a corruption of Moot Stone. On this cold and blustery hilltop, trudging among gorse bushes, we enjoy glorious views of the Highdown cliffs and coastline towards Freshwater Bay to the north west, and St Catherine’s Hill to the south east. Apparently, there are also the remains of Bronze Age barrows and an Iron Age enclosure, but we don’t go in search of them today, as the wind is chilly, and drives up back down into Mottistone Gardens for a warming hot chocolate at the tea shop. By the tea rooms, we find The Shack, once a rural retreat for architects Seely & Paget, complete with drawing boards, a basic kitchen, a small bathroom and two cabin bunks under the eaves. Built in the 1930s it is an unusual example of Modern Movement design, a precursor of the tiny house movement so popular today. Mottistone Manor was completely remodelled the 1920s by this architectural firm. The ‘Seely’ of Seely and Paget was the second Baron Mottistone and the great-grandson of Charles Seely who bought the house and estate in 1861. For the foodies, there are many eating experiences to enjoy on the Isle of Wight: a plethora of pubs; two vineyards and a gin distillery; armfuls of farm shops and seaside cafés, even a garlic farm. Not too shabby for a tiny island only 23 miles by 13 miles! My favourite eating spot this week is over in the north west of the island, only a fifteen minute drive from Mottistone. Beside Thorley Brook at the back end of Yarmouth, is the old railway station. Once part of the island rail network, the station first opened in July 1889. Unfortunately, like many other lines on the Isle of Wight, the Freshwater-Yarmouth-Newport railway, was never a financial success, and it finally closed down in 1953. For fifty years the station building housed the Yarmouth Youth Club. It was sold in 2010, when the original building was carefully renovated and decorated with a railway theme. It opened as a restaurant in 2014. The aptly named ‘Off the Rails’ now provides sustenance to walkers, cyclists, holidaymakers and locals who pass along the disused railway track that is now a path along the Yar to Freshwater. A row of banquettes in green and grey line up along the back wall to form booths, like the old British Rail compartments we haven’t seen since the 1980s. I spot a child’s model steam train on a roof beam, another perching on a window sill. Black and white photos illustrate the history of the Yarmouth to Newport line. A pile of old leather cases is stacked at one end of the room, more lie on old BritRail luggage racks above the banquettes. On our table squats an antique inspection lamp. 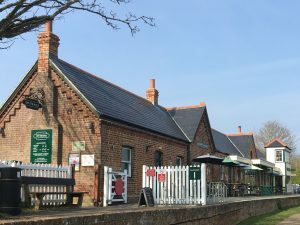 There are several outdoor tables on Platform 1, overlooking the marshes towards Thorley. Thorley Brook provides entertainment from ducks and other water birds, and there is plenty of space for dogs and children to play. On a summer’s day, the multiple bi-fold doors across the front of the café open out onto the platform. Open from Wednesday to Sunday, 9am-4pm, and Saturday night from 6-10pm, Off the Rails provides separate menus for breakfast, lunch and dinner with many nods to this railway themed diner: a Controller’s Chowder loaded with seafood; the Yardmaster’s fabulous carbonara with pork belly and freshly made pasta served up in a wooden bowl; Firebox fishcakes, moist and fresh and rolled in charcoaled coconut crumbs to resemble coal; a Trackside fish’n’chip butty, and Furnace, a smoked mackerel bruschetta, to name but a few. Anything take your fancy? Till now, I have only popped in for lunch, but if the rest is as good as the meals we have sampled, no one will suffer from a lack of tasty offerings. 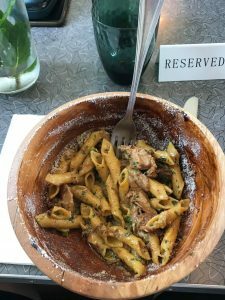 I also like the fact that the kitchen does not cater to the usual notion of a kids menu full of fried food and carbs but simply provides smaller samples of the adult menu. In addition, there are some very British events held on the premises from time to time. Fawlty Towers, Allo Allo, the Pink Panther and a Murder mystery are all on the menu this year. Best of all, after you have eaten your fill, you can walk it off with a stroll through town or out along the cycling path. Bon appétit! *With thanks to the National Trust website for photos of Mottistone and the Downs, and to Son #2 for the snap of his carbonara. Three birthdays, two wedding anniversaries and a long weekend of celebrating in Spain led to chronic indigestion and border-line alcohol poisoning, but we had a ball. We also got to spend a day in Jerez learning all about sherry. Remember that pre-dinner drink our grandparents enjoyed in tiny, egg-cup sized glasses? British wine writer Jancis Robertson once described sherry as a “neglected wine treasure”. In Andalucía, however, it is a drink for all seasons, where it is poured generously into wine glasses and quaffed with your meal. Sherry is produced in the hot and sunny south-west corner of Spain, in the region around Jerez de la Frontera. Like Champagne and Burgundy it has recently reclaimed its name as belonging only to that drink made in this south-west triangle of Spain. This ‘protected designation of origin status’ was the first of its kind in Spain. The name Jerez is a derivation of the original Arabic name for the town. 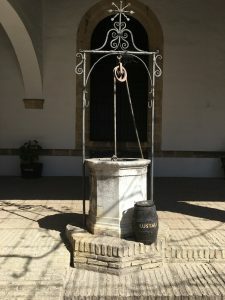 Originally known in England as sac from the Spanish word for extraction, saca, the English later anglicized Jerez to form the name of the drink: sherry. 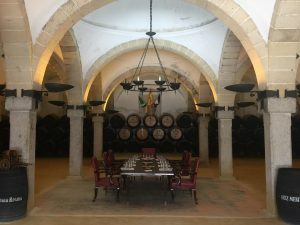 After touring three different bodegas in Jerez, we are now experts on sherry, and yes, I did take notes so that I could share all my new-found knowledge with you. Although, I have to admit, by the third bodega, my ability to analyse the sherries with a modicum of clarity or take intelligible notes was long gone. Lucky, then, that we had a driver and there was no need for any of us to get behind a wheel. The origins of this particular wine region go way back to more than a thousand years before Christ. It was the Phoenicians who first popped into Spain in 1,100 BC, bringing gifts of grape vines and olive trees. Perhaps not gifts exactly: they set up a flourishing trading post in Cadiz. The Greeks dropped by later to show the locals how to sweeten the wine with unfermented grape syrup. When they claimed the Iberian Peninsula for themselves, around 200 BC, the Romans generously continued the local tradition of wine-making. Settling in for a mere seven centuries, they made quite a successful commercial business of exporting wine throughout the Roman Empire. Then, in 711 AD the Moors arrived from North Africa. As Muslims, the Moors were teetotal. Nonetheless, they were well-versed in wine-making and also introduced the art of distillation for creating crude fortified wines, a precursor to sherry. It took eight hundred years for the Spanish to oust the Moors and reclaim the Iberian Peninsula. They immediately set to work to flex their new-found muscle and spread their territories across the Atlantic, claiming large slices of South America. Cadiz became a primary port for exploration and colonisation, and the ships setting sail for the New World were often better stocked with wine than guns. The wines from Jerez had, in the meantime, had become popular abroad. 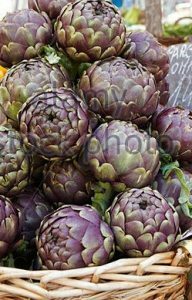 England was particularly fond of the Spanish ‘sack,’ as it was known, at least till the English broke with Rome over Henry VIII’s divorce from his Spanish Queen Katherine of Aragon. Such an insult to the Spanish King, the Pope and the Roman Catholic Church made the English merchants personae non gratae on the Iberian Peninsula for several decades. In 1587, however, Drake sacked Cadiz and destroyed the Spanish Armada. He claimed 2,900 barrels of sherry as a portion of his winner’s prize and proudly presented it to Queen Elizabeth’s Court. The Queen loved it, and thanks to such royal favour, sherry once again became popular in England. Even Shakespeare thought it worth a brief acknowledgement. In Henry IV, Falstaff states dramatically that ‘if I had a thousand sons… I would teach them… to forswear thin potations and addict themselves to sack.’ Sack, or sherry, would gain such recognition in England, that many of the Jerez cellars would later be founded by British companies – does Bristol Cream Sherry ring any bells? By the end of the 16th century, Jerez wines were again being exported across Europe and were considered by admirers to be the world’s finest wine. The fortification of wine into sherry seems to have been something of a lucky accident. During the nineteenth century, wines from Jerez began to be upstaged by Porto’s fortified wines. Spanish merchants were left with excess stock that they could only move in small amounts. The solera blending system developed – I’ll give a more detailed explanation of this later – to top up little used wine barrels. It was soon discovered that this had a remarkable effect on the flavour and aroma the wines, not to mention creating a more consistent profile. Adding brandy, as the Portuguese did to strengthen their ports, also proved a good tip, and oloroso came into being. Thus, centuries of colonisation and exploratory vinification have resulted in a wide variety of splendid sherries. Enough history. Let’s get on with the tasting! Our first stop was to Bodegas Lustau, which was established in the late 19th century by José Berdejo. In the 1940s, he was joined by his son-in-law Emilio Lustau, who expanded the business considerably. Lustau is now one of the world’s most reliable sherry brands, easily recognisable by its black, smooth-shouldered bottles. It also claims to produce the largest range of sherries. I had certainly never realized there were so many different types. Driving into the centre of the city, we were met by our guide, a long-term English expatriate, Together, we entered the cobbled courtyard behind the grand front gates. Inside, we wandered through Cathedral-like halls where some 2000 black wooden barrels were stacked three high in rows that seemed to stretch for miles. The barrels are painted black so that leaks can be seen more easily. Unlike winemakers, sherry producers are keen to avoid wood flavours in the wine, so a new barrel will be used to ferment wine or age whisky for up to 10 years to reduce the woodiness, before it is used for ageing sherry, especially the more delicate varieties. The sherry might then remain in the barrels for anything up to 30 years, and the barrel itself may be in use for a century or more. Bodegas will therefore stockpile old staves and hoops should the barrels get damaged. 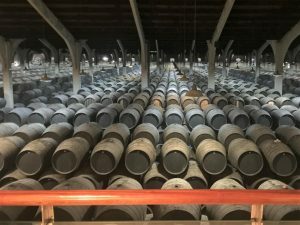 It is necessary to keep the barrels cool in this hot climate, so the ceilings rise fourteen metres high, and the walls of the buildings are extra thick. 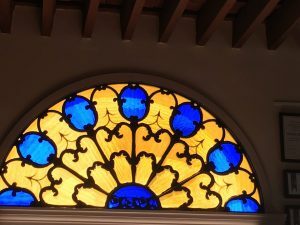 It is also important to keep the air circulating, so there is no glass in the windows, only shutters, which are closed when the ‘levant’ (hot wind) blows through. The floor consists of locally quarried sand that is packed down and watered weekly (more often in summer) which creates natural air conditioning and humidity. The first sherry we meet is fino, which is made from palomino grapes. Palomino makes up about 95% of the region’s harvest, as it is used for most sherry styles, including amontillado and oloroso. Two other grape varieties – Pedro Ximenez and Moscatel – are used for sweeter sherries that are often preferred in northern Europe over the drier styles. Harvested in August, the grapes are fermented into a base white wine and then fortified over winter. During fermentation, the barrels are not filled to the top, allowing air and space for a layer of natural yeast to form on the surface of the wine that protects it from oxidisation. Barrels can therefore be uncorked, to check the development of the sherry. Making sherry involves a system known as solera, which means floor in Spanish. Stacked three barrels high, bottling occurs from the bottom up. As each lower barrel is partially emptied, it is topped up from the barrel – or nursery – above, in a cascade-like effect that also feeds the yeasts with fresh nutrients. This method of blending ensures every bottle tastes the same. Also, as the different batches mingle, the resulting sherry becomes more mature, but at the same time adds a freshness to this older wine. Thus, sherry bottles will not usually carry a specific vintage year and can contain a small proportion of very old wine. After fermentation, the base wine is fortified with grape spirit, raising their final alcohol content from 15.5 – 18% depending on the style. Those at the higher end of the alcohol chain do not develop yeast and therefore oxidise a little as they age, giving them a darker colour. As the fortification takes place after fermentation, most sherries are initially very dry, and any sweetness is added later. In contrast, port is fortified halfway through its fermentation, which stops the process so that not all the sugar is turned into alcohol. The barrels, originally made from chestnut, are now made from white American oak, the older the better, to ensure minimum oak influence. For the sweeter sherries, the need to keep the barrels cool is not so significant. Natural sugars are increased with one of two methods: either late harvesting or drying the grapes in the sun after picking. Each style of sherry therefore develops different characteristics. Fino can be incredibly, tongue-curlingly dry, and sometimes almost salty. There is an aroma of sandalwood and honey. Puerto fino smells like popcorn and tastes like hot buttered toast. It is a real mouthful of flavour. Amontillado, a fortified fino, goes through a double aging process that makes it much more complex. It can be as dry as fino but it smells – and looks – like caramel. With a definite nutty flavour (think hazelnuts) it goes well with pecorino cheese or wild mushrooms. An Italian friend immediately planned a dinner with mushroom risotto. Olorosso, has a strong whiff of the chemical, combined with an unexpected woodiness in both aroma and flavour. Our guide recommended a strong cheese or osso buco to accompany it. These sweeter sherries pour like olive oil, with a viscosity that gives it ‘legs’ – a thick trail of wine that seems to flow down the inside of the glass like honey. These have proved much more popular than the dry sherries among northern European drinkers, although personally, I prefer the drier styles. The second bodegas we visited was also near the centre of Jerez. 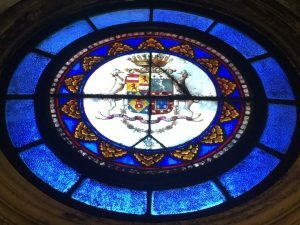 Diez-Merito was established in the 19th century. It stayed with the family until 1979. In 2016, it was bought by the Espinosa family, who added new vineyards, and established the cellar door in a lovely old building that dates to 1760. Our guide is a tall, lean Spanish woman who walks and talks at high speed in a thick Spanish accent, taking us through the details of sherry production. By now, as I hear much of this information for the second time, I am starting to feel quite knowledgeable, and nod encouragingly even at what I can’t quite follow. She also proves her point that sherry tastes better with food by sitting us at a vast refectory table and providing plates of tapas to accompany our sherry tasting. Relieved to be off our feet, we cheerfully try more sherry and munch through a selection cheese and meats. Our final visit was to the Estévez Bodegas y Viñedos. This is a vast, custom built and relatively new bodega on the outskirts of town, although the family has been making sherry since the late nineteenth century. Unlike the previous bodegas, this one uses state of the art technology, and has acquired many other labels over the years. The entrance is grandiose, the walls lined with family portraits. Our guide is Danish and well-informed. We follow her through cathedral halls where barrels are stacked to the horizon. By now, my taste buds were exhausted, and I really didn’t feel like drinking another drop of sherry. Luckily there were other forms of entertainment here. We were invited to take a peep at the horse stud out the back: beautiful glossy black stallions, tall and temperamental, and the friendlier mares and foals, soft as satin. 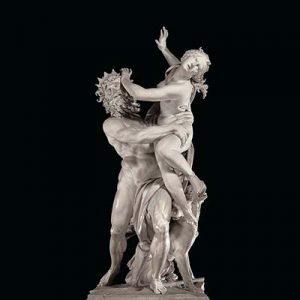 The Estévez family have also gathered an awe-inspiring collection of mostly Spanish art. This included the entire collection of Picasso’s sketches and a Miro, displayed on a mezzanine gallery above the banqueting hall, where we wandered, agog, unwilling to drag ourselves away. An outstanding day was finished off with a terrific dinner, and of course more wine. Overindulged? Totally! It is mid-February, and our last day in Rome. The One & Only has caught a cold and is happy to stay in bed, cuddled up with his pillow and the rugby. 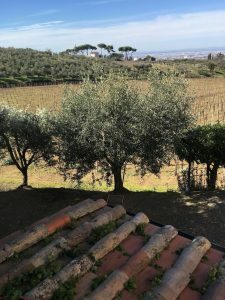 I leave him to it and take an early train from Roma Termini to Frascati, a hilltop town twelve miles south-east of the city, on the rim of a dormant volcano. The train sweeps through the outer burbs of Roma, following the scattered remains of an Ancient Roman aqueduct that once emptied a lake behind Frascati into the water tanks of the city. In recent times, several international scientific laboratories have set up home here, but I’m afraid this doesn’t interest me nearly as much as the town’s history and the fact that Frascati produces a popular white wine of the same name. I have booked a guided tour through Airbnb, with Dominique*. It promises to be a small group – maximum ten – which sounded a comfortable number. Dominique hails from California, but has been living in Italy for fifteen years. 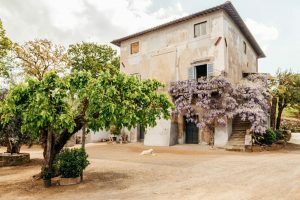 Once married to a local winemaker, she has helped build up a co-operative of three local vineyards, based at a 16th century artisan winery ten minutes out of Frascati. With an eye on the tourist industry, she has choreographed a crackerjack day out to help promote the region and its wines. Our motley crew meet up on the platform at Frascati railway station, where our exuberant local guide is waiting for us. Massimo, or Max, is full of amusing and salacious tales, both ancient and modern, about his home town. He is also well-versed about its wines. We follow him up the staircase from the station to the town. This staircase was once grander than the Spanish steps, until it was heavily bombed by the Americans, towards the end of World War II. Attempting to destroy German headquarters, they unfortunately did plenty of damage to the local population and its buildings, while barely scratching the Germans. Nonetheless, the Germans were eventually elbowed out by the Allies in June 1944. The town and its staircase has been substantially rebuilt since then. We clambered breathlessly to the top of the stairs. Here, looking out over a glorious vista of Rome, we encountered a large company of local ‘blokes’ who gather on the Viale Vittorio Veneto every day to drink coffee or wine, to gossip and, according to Max, to watch the women passing by. He suggests there is more for them to enjoy in summer when the ladies are in shorts! Frascati, once the Beverley Hills of Rome, became a popular summer resort for Popes, Cardinals and the Roman nobility from the 16th century onwards. It was here, above the sweltering city, that many illustrious citizens built a plethora of extravagant country villas around the rim of the ancient but dormant volcano. Their reward? Stunning views, cool breezes, plenty of quaffable wine. 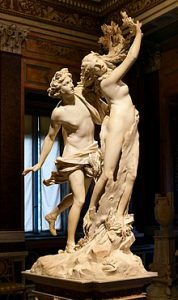 The name Frascati, according to our guide, comes from the word ‘frasche,’ or branches, which could refer to a medieval trade of collecting firewood from a hillside that was once thickly forested in oak and beech. Later, wine makers would replace this forest with chestnut trees, whose wood was thought better for making wine casks: apparently it has a lighter touch and doesn’t affect the flavour of the wine as heavily as oak. Thus, Frascati is now celebrated for its light, bright white wines rather than its acorn woods. Wine making has been popular in Italy since 500B.C. Once upon a time, the grapes came from Greece, and the wines made in Frascati rapidly became popular with the Ancient Romans, who called it ‘golden wine.’ These wines were still a firm favourite with the Popes and Roman nobility of the Renaissance, they would inspire the poets and artists of the 18th and 19th centuries and were acclaimed by ‘La Dolce Vita’ generation of the 1960s. In 1966, Frascati was granted Denominazione di Origine Controllata (DOC) status, a quality assurance for Italian wines modelled on the French system, AOC. In 2011, it rose to DOCG status, the highest quality designation in Italy, requiring producers to follow the strictest wine making regulations. By 11am we have been given our first taste of a less illustrious local brew. Stored in a plastic gallon container, Max decants it into plastic cups at the local bakery and serves it up with ‘wine biscuits’ for dipping. There is not an ounce of pretension here, but an understated appreciation of the small joys in life. The locals actually prefer the time-honoured tradition of taking their own jugs to the winery and decanting it straight from the barrel, rather than buying it in bottles. As we nibble on a selection of bakery samples, we chat with its 93-year-old owner, as creased and crunched as a bed sheet on a hot night, yet bright as a button, who still mans a stall at the Frascati market every week and touts her wares like a carnival spruiker. Afterwards, we climb into taxis waiting in the plaza to drive us around to the winery. Our guide loves to tell apocryphal tales of his fellow Italians and their subversive behaviour. He gleefully explains Italy-according-to-Max, while assuring us we will never read these stories on Google. He is a born story-teller, and it’s hard to decipher truth from fiction. One story involved hiding the Jews in plain sight from the Germans, by burning all the Frascati birth records so that Jewish residents could not be identified. Later, from a viewpoint on the city walls, he points out a shell-shaped dome we could see lying on the plains below Frascati. This, he claims, was a swimming pool intended for the Rome Olympics. Money garnered from the EU and the Italian government disappeared without a trace and left an empty swimming pool in its wake, so the competition was moved at the last minute to another complex and other hastily organized venues. I did find something on Google loosely related to this one, but Max’s yarn, as all his yarns that day, made far more scintillating listening! 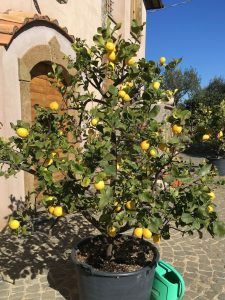 We arrive at the vineyard around midday, to find an old stone building roofed in terracotta tiles, and a courtyard dotted with lemon trees in large tubs. A future project to make limoncello or gin perhaps? This vineyard has been run by the same family for seven generations, and one of the current owners comes out to meet us, accompanied by Dominique. He is keen to share his knowledge and speaks in soft but rapid Italian, fondling the bare vines as he talks, barely giving Dominique time to translate. Nino and his brother run the vineyard together, and despite their seventy plus years, they do almost everything by hand. While many modern vineyards are using up-to-date techniques and technology, here, wine making must rely heavily on traditional methods and hours of manual labour to qualify for the DOCG recognition, which allows neither chemical fertilizers or technology. They are even forbidden to irrigate the plants. 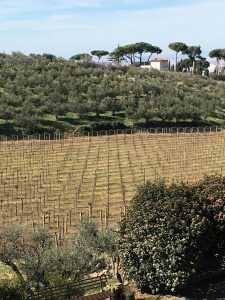 As in olden times, the grapevines are planted in a sloping crease of the hill to catch any rain, while the vines are trellised to create a canopy of leaves, shading the grapes from the sun, and retaining as much moisture as possible. Around the edge of the vineyard there are five hundred olive trees more than four centuries old. All the pruning, of both vines and trees, is done by Nino and his brother, who jealously guard this vital role. We wander through the sleeping winter vines, nudged by the girdle of olive groves. The soil here is well drained and largely volcanic, which makes it incredibly fertile and creates prolific harvests. The volcanic ash also makes the soil porous and rich in potassium, which gives the wine a noticeable mineral flavour. Many of the vineyards in this region, including this one, have cellars dug out of the volcanic rock, ideal for storing the wine. Nino’s wine cellars are hidden beneath the 16th century farmhouse. A narrow tunnel, dug into the porous black rock, slopes gently downwards, the temperature dropping with each step, dusty bottles stored in niches on either side. Here, the only sign of modern wine making is a large steel tank. Frascati is now made in steel tanks to reduce tannin and completely avoid any flavouring from wooden casks. In the bowels of the earth, we discover large pottery urns and green, blown glass flagons from Venice, both used to store the wine before stainless steel was invented. Only the dessert wine gets a little time on wood. This is not the syrupy-sweet dessert wine I am familiar with, but a lighter variety, the taste drifting away like butterfly wings, sweet but not cloying. It is made from grapes dried to raisins, and then squeezed in a hand press to within an inch of their lives to garner every last drop of sugary juice. In a dining room on the first floor, with a Juliet balcony wrapped in wisteria vines, we finally get to taste the three wines that are made here: a light, smooth white (Frascati Superiore); a mild red (Vagnolo), and a sweet wine (Cannellino di Frascati). To accompany the wine, Dominique has arranged small snacks: slices of homemade pizza and pecorino drizzled with honey. We learn that parmesan (or Parmigiano Reggiano) is made in the north from cow’s milk, whereas Pecorino Romano, originating further south as its name suggests, is made from sheep’s milk. (The word pecora is Italian for ‘ewe.’) They have a similar, hard texture, but pecorino is saltier, while parmesan has a denser flavour. Plates and glasses emptied and shopping done, we gather in the courtyard for a final chat with Dominique, accompanied by the clinking of our treasure trove of wine and olive oil bottles. After fond farewells, we head back to town for lunch, where we feast like kings at a local cantina, on the best pepperonata I have ever tasted, mixed with diced roast potatoes. Two more platters follow: a white bean and tomato dish, and carciofe and green beans. Greedily, like Oliver Twist, we all go back for seconds, before we realize there is more to come: two different pasta sauces, one red, with beef, one white, with broccoli. And while we devour these simple but luscious dishes, Max pours the wine, first from bottles from the winery, later in carafes – doubtless from a plastic container! Anyone for dessert? It is a merry meal, full of laughter and limoncello, as we share our own tall tales and make new friends. I cut my losses while I can still walk in a straight-ish line, and stroll through town where a pre-Lenten parade is beginning. This involves much flinging of confetti, a brass band, and half the town in costume. Among the younger participants, there is a plethora of princesses, policemen and spider men. I even spot a discombobulated lap-dog dressed as a black and yellow bumble bee. I stand on the church steps, absorbing the excitement for a while. Then, in reasonable order, I make my way through the crowds and down the long staircase to the station where a few of our number have already gathered. The ride back to the city adds a final note of jollity and chatter to a superlative day. **With thanks to Dominique’s website for the photo of the wisteria in full bloom (as it wasn’t in February!). The rest are my own. St Helen’s is an attractive English village that boasts rich tales of royalty and smugglers. It is centred on a long, broad green that sits high above St Helen’s Duver, on the eastern end of the Isle of Wight. A duver – it rhymes with cover – is local lingo for an area of sand dunes. In the late nineteenth century, St Helen’s Duver was a golf course by the sea, and the Royal Isle of Wight Golf Club soon rivalled St. Andrew’s in Scotland. Making use of the existing sand dunes and shrubbery, turf was also brought down from Cumbria to create a popular nine-hole course that opened in 1882. It was originally a men’s only course, and Edward VII, then Prince of Wales, became its Patron and first President. His younger sister, Princess Beatrice, who was Governor of the Isle of Wight for many years, would later become President of the Club until her death in 1940. The Club quickly became popular with politicians, celebrities and the extended Royal family, who often stayed with Queen Victoria at her nearby island retreat, Osbourne House. Unfortunately, club membership diminished dramatically after World War 2 and the Club finally closed in the 1960s. It was decided by the remaining members to present the land to the National Trust. 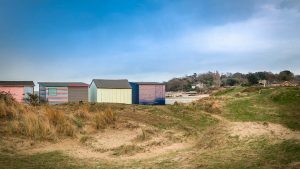 The original weatherboard clubhouse has been converted into an attractive and comfortable National Trust holiday cottage, where we stayed for a gloriously windy week in January. Now the golf course is common land, and popular with many local dog walkers… and ducks! Long before there was a golf course, there was a church just above the beach. The Church began to collapse in around 1550, as the coastline beneath it was eaten away by the sea. Today, only a portion of the Tower remains. It has been bricked up on the seaward side and painted white, for use as a sea mark, that identifies the approximate position of a maritime channel or hazard, so boats can navigate safely. 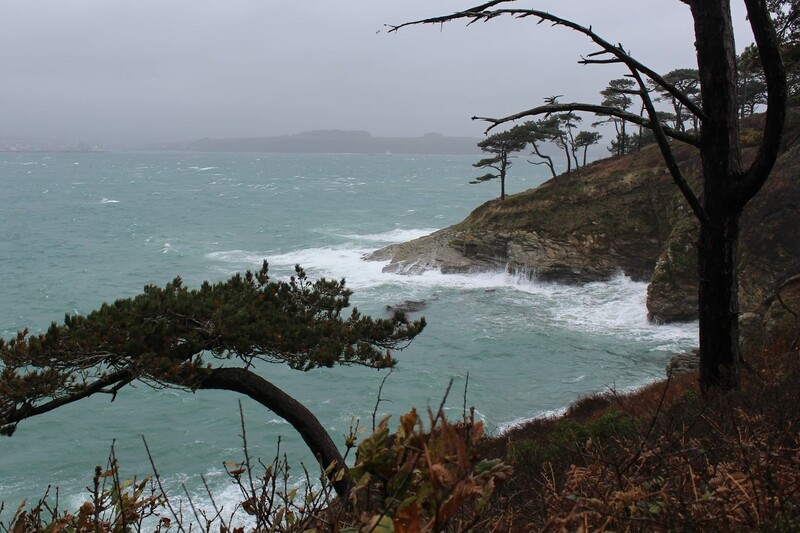 In the eighteenth century, a local fisherman gained notoriety here as a smuggler. Dickie Dawes was reputed to have hidden his contraband brandy and tobacco beneath the gravestones in the old churchyard, before hefting it through secret passages to the village and the Cluniac priory. 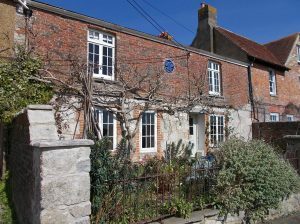 Dickie’s daughter, Sophie, was born in a small terraced house on the upper green of St. Helen’s in about 1795. A real rags-to-riches, Pygmalion-style story, Sophie was sent to the workhouse at Newport when her father died, but she would eventually find her way to the French court. After leaving the workhouse, she gained a position as a chambermaid in Portsmouth. Moving on to London, she was employed as a servant in a high-class brothel in Piccadilly. There, she met the exiled French Duke de Bourbon. Pretty and quick-witted, she soon became his mistress and protégée. Later, she followed him to Paris, where she became a minor celebrity in the court of Louis XVIII. The Duc arranged a dowry and a marriage of convenience to his military aide, but kept her as a lover, bequeathing her a title and, on his death in 1830, a large fortune. However, the circumstances of his death (he was discovered with a rope around his neck) and her subsequent inheritance, cast suspicions on the Baronne de Feuchères, and she was forced to flee back to England, where she died a decade later, still entangled in legal squabbles about her inheritance. Today, she is remembered by a simple blue plaque on the house of her birth and the nickname the Queen of Chantilly, after one of her lover’s properties. 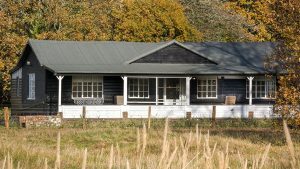 A couple of miles north of St. Helen’s, a once-popular pub at Pondwell has recently metamorphosed into The Mermaid, a bright and airy home for the Isle of Wight Distillery and its new cocktail bar. We popped in to try its latest concoctions and to look at the beautiful gin stills with their flute-like pipes, set up in what used to be the pub kitchen. The weather was a little chilly, but the large deck at the rear, overlooking vineyards and a glimpse of the sea, will provide a wonderful summer destination. Pete Muspratt welcomed us enthusiastically, and offered to take us through the story of the Isle of Wight Distillery, followed by a tasting of their products. The distillery was set up in 2014 by experienced wine and beer makers, Xavier Blake and Conrad Gauntlett. Old friends, they were keen to expand their business and have successfully ridden the wave of the latest drinking trend: gin. Mermaid Gin is a smooth and sophisticated gin made from a barley-based spirit from Manchester and ten botanicals, many locally sourced. We followed the recipe with interest: coriander is grown across the Solent in Sussex and the citrusy Boadicea hops come from Ventnor’s Botanical Gardens, on the southern side of the island. The rock samphire, known locally as Mermaid’s Kiss (hence the name of the gin), also grows on the cliffs in the south. Peter lets us dip our finger into a testing jar of liquorice powder, which is surprisingly sweet, while the oris root, used as a fixative, has a flavour reminiscent of camomile tea. Then there is elderflower, Sicilian lemons and the unexpectedly peppery Grains of Paradise from Ghana. 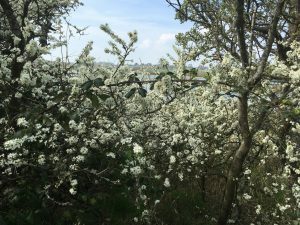 With the popularity of boutique gin distilleries on the mainland, the Isle of Wight Distillery has had to plant its own juniper bushes in the vineyard, and in the meantime, they import the berries they need from Macedonia. The botanicals are mixed together and steeped for 24 hours to release all the essential oils. The spirit rests for seven days to ‘allow the flavours and aromas to mellow and marry together.’ The result is described as a ‘smooth, refreshing, and complex gin with a contemporary style’ with a nose of ‘fresh citrus, sweet spice, gentle juniper.’ Pete suggests that it is best drunk with Fever Tree’s elderflower tonic water. The HMS Victory Navy Strength Gin, named for Nelson’s warship, is aged in oak barrels from the famous ship, in partnership with the National Museum of the Royal Navy. 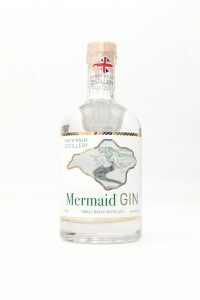 It has a higher concentration of botanicals than the Mermaid gin, giving it a greater intensity of flavour. In the 18th century the Royal Navy ruled that all naval ships were to carry gin on board that had to be 100° proof – the English standard of the day – which equates to 57% ABV, or alcohol by volume. It was discovered that gunpowder soaked in alcohol stronger than 57% could still be ignited, and this became the standard test for Navy Strength or ‘gunpowder proof’ gin. A percentage of the sales apparently goes to support the ongoing restoration of the HMS Victory. Apart from these two gins, the Distillery also laid down its first barrel of Whiskey in 2015, which is almost ready to be launched on the world. Rock Sea Vodka is a grain distilled Isle of Wight vodka, with a subtle addition of rock sea salt for smoothness and a sense of salt on your lips after a day at the beach. And finally, a dark rum: HMS Victory Rum is a blend of aged demerara rum from Guyana, Trinidad and Jamaica. It is, so Pete tells us, reminiscent of the taste of traditional ‘rum tots’ issued on board naval ships. The rum has been refined and rested in oak barrels using an oak stave from HMS Victory herself, which adds a depth of character. The One & Only, a keen rum drinker, was delighted with the Victory rum. 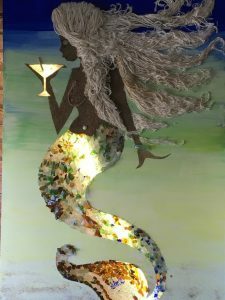 I preferred the Mermaid Gin, though, and went home happily with a bottle. and whistles through the wires. torn to shreds by a taunting squall. thank God, by the fierce breeze. to hide from this irascible, cantankerous, querulous wind. crunching underfoot like broken glass. as the wind whips by. 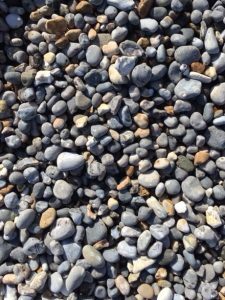 *with thanks to the One & Only for his pebbles. The rain has driven me off the somewhat slippery cobbled streets of Prague, and I am sitting in a corner of a rather elegant coffee shop on Rybinska with a flat white coffee and ‘torn pancakes with cinnamon sugar’ accompanied by a bowl of whipped cream garnished with a spray of mint leaves. The latter hasn’t proved a great choice – the pancakes have literally been ripped up and refried in cinnamon sugar, creating a crunchy, sugary clump of inedible ex-pancakes. The pot of canned cream does nothing to improve them. But it is warm and dry in here, and relatively peaceful considering I had to queue for a table. For the past three days we have roamed this romantic, enchanting city with our sons, revisiting old haunts and relishing new ones. It is over sixteen years since we last visited Prague, eighteen since we lived here, when we welcomed in the new millennium from a perch above the Vltava, our pint-sized children dragged unwillingly from warm beds into the frozen night to watch the sky explode into technicolour bouquets. Much has changed, and nothing has changed. The small primary school the children attended by the river has grown exponentially and our rather ramshackle country village is full of smart new houses. Yet the woodland paths are surprisingly familiar, the ghosts of chocolate coloured puppies and well-wrapped children dashing ahead between the trees. The city of paneláks in Prague 9 still crown the cliffs across the river and the allotments behind our house are obviously still in use. In the Old Town, the endless array of glorious buildings still makes us gasp in wonder, and the names are like faint echoes of children’s nursery rhymes, whispering their once-familiar magic through our memories. It is cold – well, it is winter after all – but not painfully so, as we wander through market squares and winding lanes. The 14th century sandstone Karlův Most (Charles Bridge) is almost as thick with tourists on this dark winter afternoon as it is in the height of summer. I am in thrall to the spires and the statues, the Art Deco and the domes, the Baroque, Renaissance and Gothic buildings. Always there is a facade to gaze upon and exclaim at, even as your feet stumble on the beautifully patterned cobblestones. I can’t stop walking and yet I also want to sit in every cosy little bar or coffee shop and soak up the atmosphere. We are delighted to rediscover a tiny restaurant in Malá Strana. ‘Čertovka’ is reached by a staircase so narrow there is a traffic light to prevent jams. Apparently, it was an old fire lane, the only one remaining in the Lesser Town. The service here has become infamous for its shoddiness, but the view to the Charles Bridge and along a narrow canal that runs beside it, is rather special. The name of the restaurant actually comes from the name of this canal or stream, an arm of the Vltava that used to feed the many mills and tanning works along its banks. I remember the lush horse chestnuts in summer that would shade the terrace as we sipped wine and looked out over the water. My sister-in-law once made a lovely charcoal sketch of the scene. The food is good, if a tad more expensive than some, but I am happy to pay for the view and a dose of nostalgia. Number One Son is delighted to taste a Czech dish he adored as a child: slabs of bread dumplings drowning in rich meat gravy. International cuisine has made some headway over the intervening years, but Czech and Italian restaurants still dominate the culinary scene, as pork and pizza become our staple diet. And the One & Only was thrilled to find that the Christmas carp is still sold fresh from tubs on the side of the street. Further down the road, on a different day, we come across a well-heated courtyard with sheepskin coverings on the bench seats. Here we indulge in a lunchtime meat fest of extraordinary proportions: dinosaur-sized spare ribs and stonking great pigs knuckles, to the delight of the One & Only, all accompanied by buckets of Czech beer. Pilsner Urquell or Staropramen, I can’t remember which, yet, notoriously disinterested in beer, I rather like these lighter Czech varieties. After gorging ourselves to bursting point, we set off uphill to walk off the calories in the fading light and find Pražský hrad (Prague Castle) at the top of the hill, with the stunningly beautiful Saint Vitus cathedral tucked behind its walls. Somewhat obscured by the castle buildings at ground level, Saint Vitus can, nonetheless, be seen clearly on its hilltop from almost anywhere else in the city. A life-sized straw nativity has been arranged to one side of the cathedral’s vast entrance (I loved Mary with her straw pigtails), and the gargoyles and glorious wrought iron gates keep us glued to the spot in awe for some time. The castle buildings represent virtually every architectural style since the 9th century, including its Gothic cathedral and the Romanesque Basilica. A UNESCO World Heritage site of almost 70,000 m², the castle was extensively renovated and extended during 1918-1938, to include a palace for the President of the newly created Czechoslovakia. Today it is a bustling tourist destination, even at 7 pm in late December. And the views from its walls are breath-taking, especially at night, like something from a fairy tale. We wander up to Václavské náměstí (Wenceslas Square) named for the patron saint of Bohemia. Wenceslas Square is more avenue than square, crowned by the elegant, neoclassical Národní Muzeum, or National Museum. All the trees are draped in tiny fairy lights, and the avenue is lined with stalls sell snacks and Christmas crafts. Here we nibble on roast vegetables, sausages and trdelník, a traditional eastern European sweet pastry that is rolled around a stick, coated in walnuts and sugar, and grilled. Some fill its hollow centre with Nutella or cream. One evening, we meet up with my godson and his cousins in a local brewery near the square. ‘Restaurace Novomestsky Pivovar’ on Vodickova was a favourite while we lived here. Eighteen years ago, the owners sent over a whole suckling pig complete with trimmings (chips, sauerkraut, horseradish by the gallon) for Christmas lunch. It was a gastronomic delight and solved the problem of feeding fifteen people from my tiny oven. Today we order generous platters of Czech style antipasti, and towers of home-made beer, followed by the ubiquitous variations of pork and potatoes. The staff are friendly and helpful, and the food is immensely filling and tasty. Christmas shopping puts in a last-minute appearance, as we dash to jewellery stores, Hamley’s and the Lego Museum. 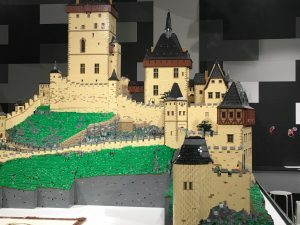 A fabulous Lego exhibition in the basement of Hamley’s holds us captive for ages, gazing upon the castles and cathedrals of Bohemia in intricate and spectacular detail. Meeting friends eventually takes priority over a plan to attend a Christmas concert in one of the many church venues, but the lapse simply provides an excuse to return. 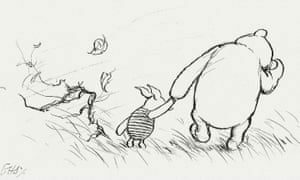 Number Two Son doesn’t remember living here – he was not quite three when we left – but he has proved invaluable with his instinctive sense of direction, and we are rarely lost, even when memory fails us. It has been a wonderful walk down memory lane, one I would love to repeat in the spring, as the trees start to bud, the days grow longer and the chill has gone from the air. *With my usual thanks to the One & Only for his fab photos. It is a Sunday morning in mid-December. We are in Köln (Cologne) in western Germany, wandering along the Rhine, with our hands buried deep in pockets, and scarves wrapped almost up to our eyebrows as an icy wind whips around our ears. Despite the risk of frostbite, the promenade is surprisingly well frequented with families, young lovers, elderly couples. Walking through the streets of the old town last night, it was seriously cold. Frigid, in fact. Like everyone else, we huddled together around the stands selling local beers, glühwein and eierpunsch (eggnog). It was a simple a survival technique. And we were hardly surprised to see a frosting of snow on the roofs this morning, much to the delight of our Number One Son who had recently arrived from a 40’C summer in Australia. Since the beginning of the month, friends from Luxembourg have been travelling far and wide to shop at every Christmas market they could find, and the reports have been enthusiastic and varied. Having a very low tolerance for Christmas shopping, I waited to realize a long-standing plan to meet old friends in Cologne, where, it turns out, there is not just one Christmas market, but a clutch of them: Weihnachtsmarkt Altstadt, in front of Cologne´s town hall; Weihnachtsmarkt am Dom, with the largest Christmas tree I have ever seen, dwarfed only by a backdrop of the huge cathedral standing proudly behind it; Stadtgarten; Neumarkt’s Market of Angels, and a colourful gay and lesbian market… the list goes on. Having met our friends at the hotel, we headed first to the Cathedral, struggling not to lose each other in the dense crowds. My extra tall friend and my One & Only were understandably smug about their superior view of the world, while her shorter husband and I linked arms for moral support, well below the surface of the human tide. Around the base of the Cathedral clustered the Weimersmarkt stalls, and breathing space was at a premium. To move forward was to squeeze through bodies like blood through a clotted artery. But the bodies were friendly and the mood happy. It was a crazy, but surprisingly contented crowd. No one was pushing or shouting, everyone waited patiently and politely for service, however long the queue. There was no ounce of aggression, or drunken rowdiness, but a real sense of goodwill in the air. We tried a couple of the local specialties to assuage hunger: flammkuchen and gebrannte mandeln (candied almonds), wurst in a variety of sizes and kartoffelpuffer (potato pancakes), schupznudeln (potato gnocchi and bacon) and crepes. We are in the land of pork and carbohydrates, and in this chilly weather, it is a perfect diet, although my jeans may beg to differ. Craft stalls, too, were plentiful, but it was around the food and drink that the crowds converged. Fairy lights hung above our heads, coating the mighty tannenbaum in the centre of the platz, even twinkled on our heads, in the shape of a spiral-topped, red headband. Now there would no losing one other. At centre stage, a band was singing Christmas tunes, as we sipped glühwein from rather garish, festive mugs that we will undoubtedly take home as souvenirs. A group of geeky Santas were warming up beside us, their cotton wool beards already askew, their glasses steaming up. A Christmas bucks night, perhaps? 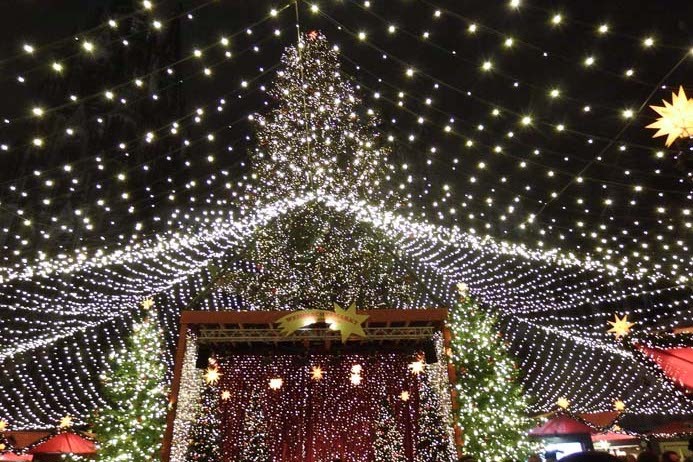 Christmas markets have been popular in Germany since the late middle ages, all through the four weeks of Advent. In the twenty first century, their popularity has expanded across Europe. Now, the festive season is ushered in with a plethora of Christmas markets across Germany, Austria and Switzerland, Belgium, Spain and France. Luxembourg City alone has four or five. In Place Guillaume II there is a skating rink popular with the kids, and the Place d’Armes has a bandstand for live performances and a carousel or two, not to mention all the pretty wooden huts lined up neatly around every city square. And it is such fun and provides such childish delight to see the city streets humming with activity even on these dark, dull winter afternoons, while the forest of pine trees decked in fake snow and baubles give off a nostalgic scent of Christmas to warm the cockles of the heart. Trelissick House is a three-hundred acre country estate just outside Truro in Cornwall. 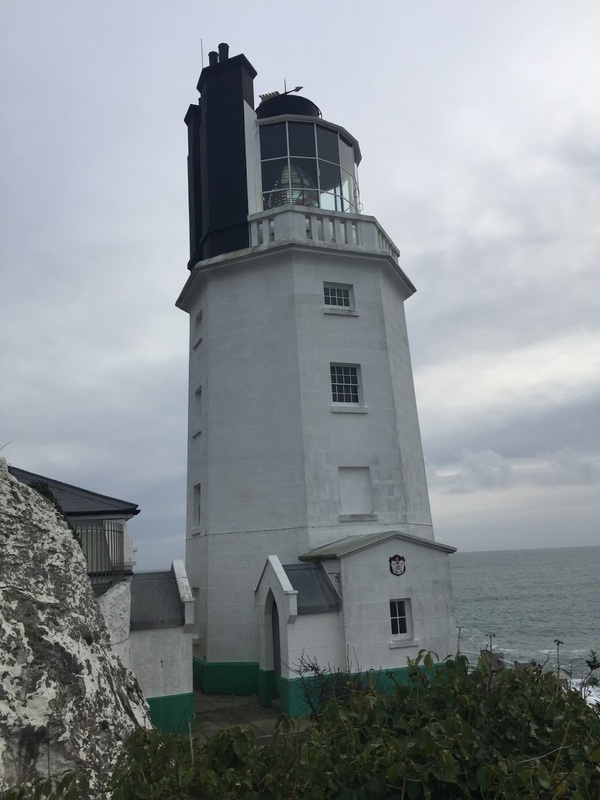 Built in the 18th century by the Lawrance family, has had a chequered history, having been bought and sold several times over the intervening centuries. Today it is owned and run by the National Trust. The Trust has managed the gardens since 1955, but only took over the house about five years ago, when the previous owners auctioned off the family heirlooms and moved to a more manageable house in the area. It is rare to find a National Trust property that has been brought into the modern world. The vast kitchen was only upgraded a dozen years ago and has been turned into a coffee shop, with a little snug above it that overlooks the kitchen garden. It is amazing to step into such a grand old house, and yet be able imagine how it would feel to live in such a place in the 21st century. Trelissick House sits on a narrow peninsula above Carrick Roads, the oddly named estuary of the River Fal, and is wrapped in acres of gorgeous gardens, designed like outdoor rooms that, even in winter, are a joy to wander through on a clear, blowy afternoon. All the reception rooms on the east side of the house have wisely been installed with tall, broad windows that provide beautiful views across green parkland and over the water. There is even a haha, a deep, dry ditch, lined with a stone wall, and thus concealed from sight. Used in landscaped gardens and parks in the eighteenth century, it was designed to give the illusion of a continuous rolling lawn, whilst providing boundaries for grazing livestock. The ha-ha got its name from the effect of this optical illusion, as any visitor approaching the hidden ditch would suddenly come across it and cry “Ah-ha!” in surprise. We arrived on the morning it re-opened especially for the Christmas season. The stables had been set up with Christmas craft stalls, the rooms of Trelissick House had been decorated with huge Christmas trees and colourful flower arrangements. In the library, the Christmas tree was decorated in the green, white and purple, not for Wimbledon, but for the suffragettes, as this is not only the centenary year of the Armistice, but also of women’s right to vote in the UK, and one of the previous owners of Trelissick was an enthusiastic supporter of the Suffragettes. In the music room, a volunteer played Christmas carols on the grand piano, and the scent of pine suddenly made it feel a lot like Christmas. I found myself humming the tunes under my breath as we wandered through the vast reception rooms and gazed out over the fields. Back in the garden, a sheltered tennis court overlooks the Fal, and I couldn’t help thinking that it was a thoroughly distracting view for potential tennis players. An arched wooden bridge crosses the deep lane that heads down to the King Harry ferry, and lands in the orchard, planted over twenty years ago to preserve several local, heirloom apple varieties. The gardens themselves are full of fascinating and exotic specimens, many garnered by one peripatetic son of the house from as far away as Australia and New Zealand. There is also a very decorative Rapunzel tower, which we thought at first was a pretty folly, but apparently started life as a water tower, and is now a quirky holiday rental. Behind the house is an array of attractive farm buildings that have been converted into a café, an art gallery, the ubiquitous National Trust gift shop, a plant nursery and a large second-hand bookshop where I went completely mad and came home with an armload of books that cost the princely sum of £15.00! Feeling in need of a longer walk, we headed into the parklands to follow a woodland path around the peninsula and along the edge of tidal creeks, catching glimpses of the river through beech and oak and wading through inches of fallen leaves. Oyster catchers vacuumed the sand for afternoon tea and a lone heron stood guard on a rock. Young, boisterous dogs charged past, gathering sticks in their mouths, while older ones paced slowly along behind, obviously longing for home and a cushion by the fire. Strolling through this ancient woodland, it is easy to imagine you have stepped back in time and will emerge to see horses and carts rolling down the lane. Much to my disappointment, my Thomas Hardy moment never happened, but it does feel as if little has changed here over the last two or three centuries. And like those older dogs, I can now curl up happily by the fire with plenty of reading material. *With thanks to Google images for the photos, as the One & Only forgot his camera!